KIEV, Ukraine -- Ukraine’s leaders looked to shore up the ruling coalition after the speaker of parliament warned the nation is entering a “serious political crisis” following the resignation of its reform-minded economy minister, who accused presidential party members of corruption. Prime Minister Arseniy Yatsenyuk at an emergency government meeting on Thursday said the cabinet remains united and committed to overhauling the economy. Four ministers who earlier submitted resignations said they were ready to return for the sake of the reform program. 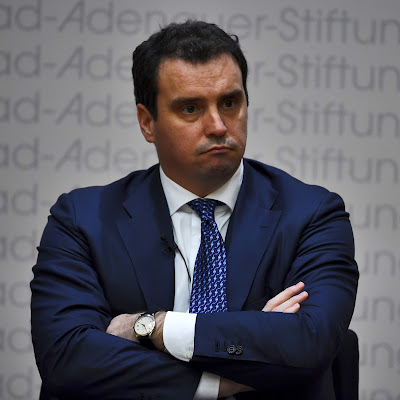 Former Economy Minister Aivaras Abromavicius didn’t participate in the meeting and won’t change his mind after having quit Wednesday, his press secretary Oleg Shimansky said. “This crisis must be resolved by political parties’ representatives along with the president,” Volodymyr Hroisman told reporters earlier Thursday in the capital, Kiev. Abromavicius in his resignation speech said he wouldn’t be a “puppet” for officials he accuses of blocking overhauls of the ex-Soviet republic’s economy and institutions. President Petro Poroshenko said last night that Abromavicius, a Lithuanian-born former fund manager, should stay on and that his allegations should be investigated. His resignation still requires approval by lawmakers. Ukraine’s government, which swept to power in 2014 after pro-European street protests opposing years of corruption, has seen its ratings plummet over delays in reforms. The U.S., which has made billions of dollars in financial aid contingent on progress to overhaul the economy, expressed its disappointment on Wednesday at Abromavicius’s exit. His resignation also widened cracks in the ruling coalition, which is still dealing with the war in Ukraine’s east. Poroshenko has promised changes in some cabinet positions. "The government isn’t going to tolerate political pressure from partners in the coalition or from any other political force," Yatsenyuk said at the cabinet meeting. The hryvnia which has lost 7.1 percent this year, was 0.4 percent weaker at 25.85 to the dollar at 6:50 p.m. in Kiev. Poroshenko on Thursday met ambassadors from Group of Seven countries and the European Union as well as Yatsenyuk and Hroisman to discuss the pace of reforms and the situation with the cabinet. “The government needs an urgent reboot,” Poroshenko said on his website after the meeting, urging reform-minded ministers to stay. The ambassadors called for unity among Ukrainian authorities, according to the statement. “Poroshenko will likely seek to use the cabinet reshuffle to calm the situation and seek candidates with a pro-reform image for some key cabinet positions,” said Otilia Dhand, a senior vice president at the Teneo Intelligence consultancy in Brussels. Ukraine’s efforts to stamp out corruption brought scant progress last year, according to Transparency International, which said in January that civil society, journalists and whistle-blowers were more effective than government officials in combating graft. The nation of 43 million people ranked 130th of 168 countries in the Berlin-based watchdog’s Corruption Perceptions Index, level with Iran and Cameroon. The results of Ukraine’s anti-graft endeavors -- key to the continued flow of financial aid, including a $17.5 billion loan from the International Monetary Fund, will be assessed by lawmakers during the week of Feb. 15, when Yatsenyuk is scheduled to report to parliament on his cabinet’s performance. The IMF expressed concern over Abromavicius’s resignation. Christine Lagarde, the Washington-based lender’s managing director, praised the ex-minister for his work in overhauling the economy and attracting investment. She also urged the government to step its anti-corruption efforts. “We’ve known all along that in relation to corruption, a lot of work needs to be done, and it has to be implemented, enforced rigorously, because the authorities are accountable not only to the Ukrainian people, but also to the international community," Lagarde said Thursday in Washington.